Sup guys, so here she is! 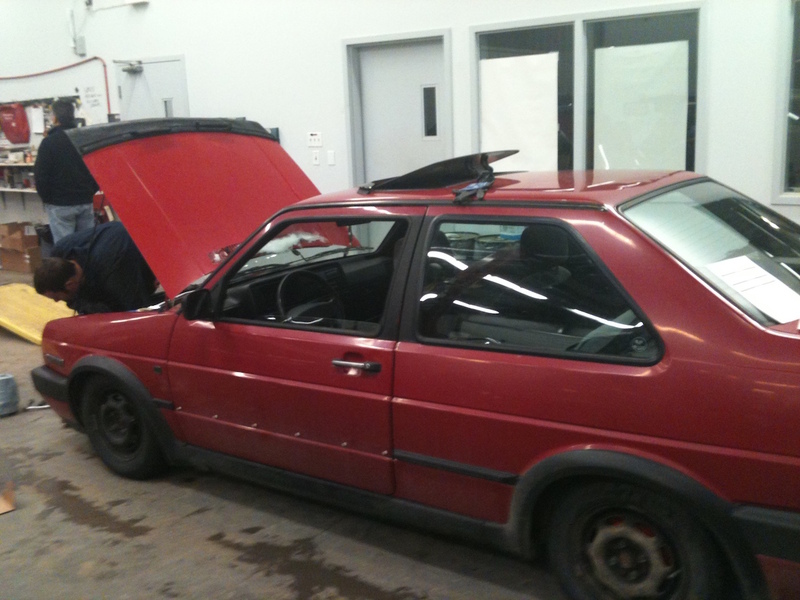 My current project and favourite car that I've owned so far, my 1990 Jetta Coupe. She started life out as a 1.8L 8v. And ran all the way up to about 250,000km at which point the fuel pump gave way. The motor was still running quite well, but I didn't see the point when I was in the process of working out a deal on a VR swap. 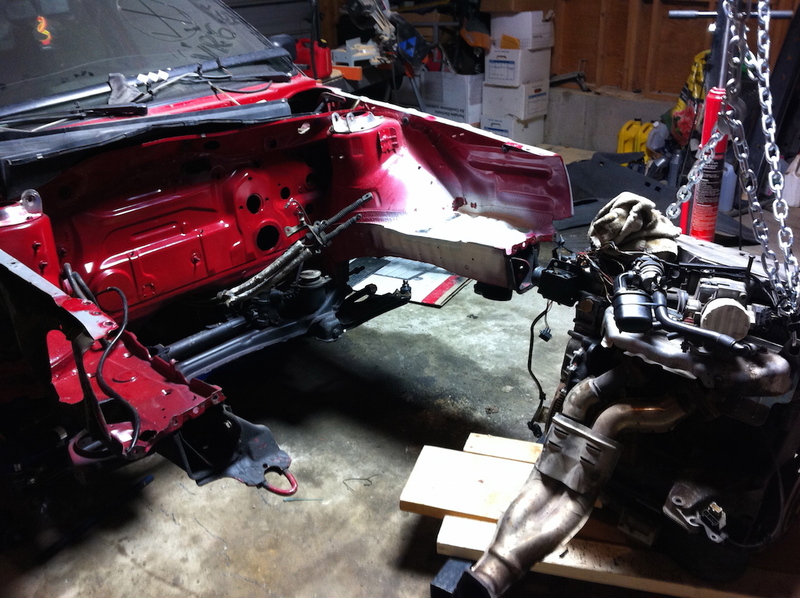 So under the knife she goes! When I was first looking for a MK2, I stumbled upon many, all of which weren't exactly what I was looking for. Eventually after trolling the tex, and developing a new love for coupes, I started searching for one. I found this car, but the seller wanted $3000 for it. At that time, I was a poor student and I had a budget of about $1200. So the coupe was a no-go. 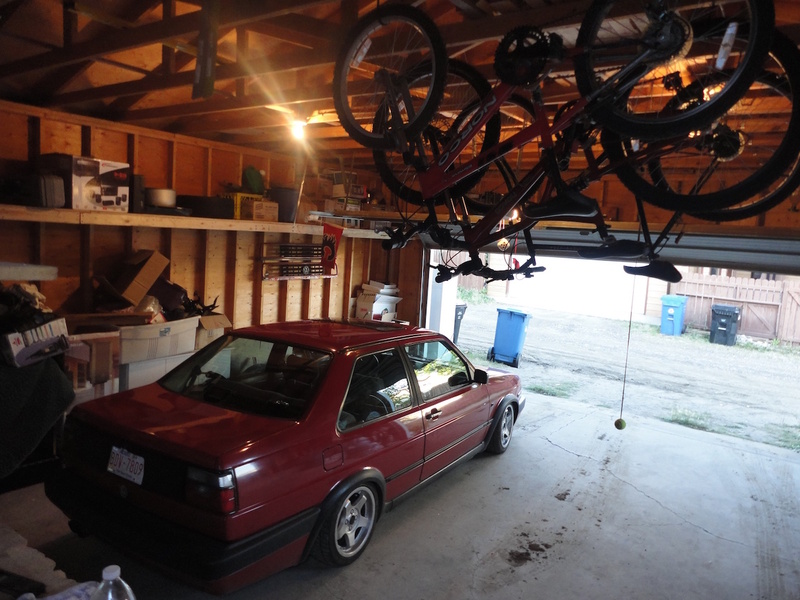 I was bummed out but moved on… into a 1986 Jetta coupe that I picked up for $1000. I rolled around in that for a while until I randomly decided to post it up for sale. She finally sold, and literally in perfect time, the same red coupe I was looking at before for $3000 was now up for $2200. I didn't want to spend more than $2000 this time, so I negotiated and snatched the car up for $1800. 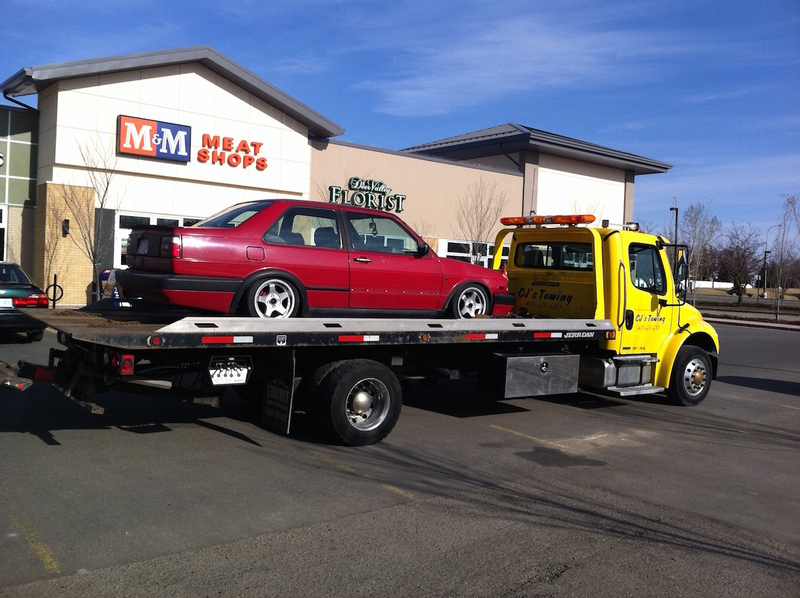 I bought the car at about 235,000km on it, and drove it for about 15,000km. I had a blast with the car even though it was stock other than an intake/exhaust. It's the second Jetta coupe I've owned, but for some reason, she has a special place in my heart. Over the year I changed up a few minor things, cleaned her up, bought various parts, lights, grilles, wheels, seats, steering wheels etc. But all along I wanted to do a VR swap so I started searching for one. 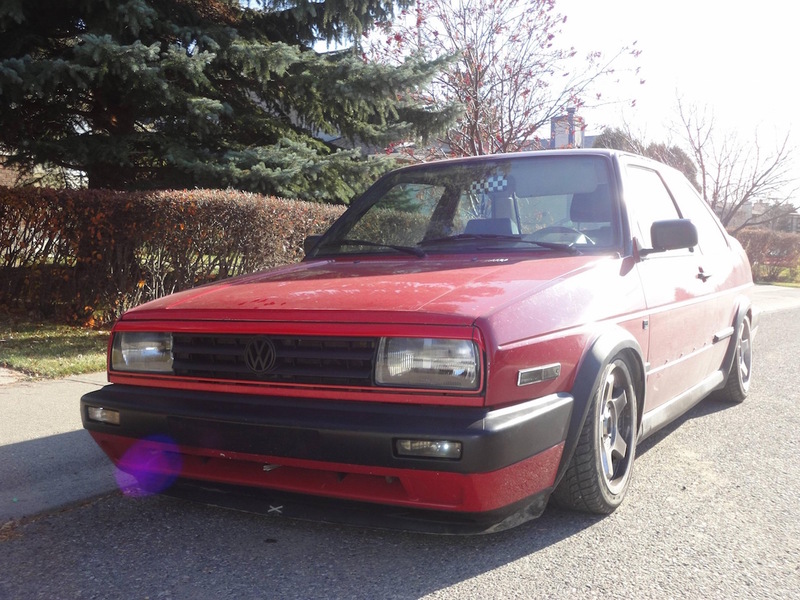 At some point, I posted my quad rounds up for sale, and Keith (dubCanuck1 on the old forum) bought them, and notified me that he will be posting a couple VR6 setups up for sale soon. So sure enough, I had me a VR swap! Anyway I'll shut up now and let the pictures tell the rest of the story. Enjoy! First summer car wash pic, one of my fave pics! Nothing a DD band-aid can't fix! Finally the fuel pump gave way. Time to tow home and rip it apart! Hope you enjoyed, more to come hopefully soon! Last edited by Fizzo20 on March 7th, 2015, 2:53 am, edited 1 time in total. Looks good dude! Get on it! ahhhh I see, ya got all stoned, had a high-dea and decided to make a thread. Wow dude! Bay looks to be in great shape - bonus! should be fun once its done though and not to mention fast. Wow made it look so nice, from what it was originally. Cant wait till you get her going with that VR. So last weekend, got some important stuff done, which was good. Got the shifter mounted, got the SAI, EGR and A/C deleted. Fixed/replaced some broken hoses/pieces on the motor. Mocked up the motor in the bay. This saturday, the plan is to go through the wiring, label it and begin wiring it up. Rajiv (Mushroom_curry) is coming over to help me out with that. Anyone is welcome to come by and have a beer/chat, whatever! Last edited by Fizzo20 on March 7th, 2015, 2:50 am, edited 1 time in total. Money + mouth .. Im in ajax..